When the day of Pentecost had come they were all together in one place. And suddenly a sound came from heaven like the rush of a mighty wind, and it filled all the house where they were sitting. And there appeared to them tongues as of fire, distributed as resting upon each one of them. And they were all filled with the Holy Spirit… (Acts 2:1-4). In the liturgical services of the feast of Pentecost, the coming of the Holy Spirit is celebrated together with the full revelation of the divine Trinity: Father, Son, and Holy Spirit. The fullness of the Godhead is manifested with the Spirit’s coming to man, and the Church hymns celebrate this manifestation as the final act of God’s self-disclosure and self-donation to the world of His creation. For this reason Pentecost Sunday is also called Trinity Day in the Orthodox tradition. Often on this day the icon of the Holy Trinity—particularly that of the three angelic figures who appeared to Abraham, the forefather of the Christian faith – is placed in the center of the church. 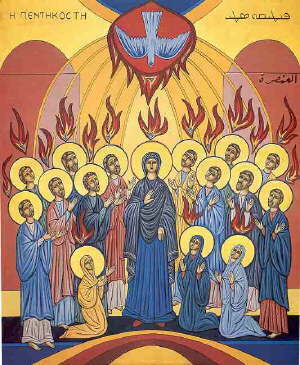 This icon is used with the traditional Pentecostal icon which shows the tongues of fire hovering over Mary and the Twelve Apostles, the original prototype of the Church, who are themselves sitting in unity surrounding a symbolic image of “cosmos,” the world. Thus, Pentecost is called an apocalyptic day, which means the day offinal revelation. It is also called an eschatological day, which means the day of the final and perfect end (in Greek eschaton> means the end). For when the Messiah comes and the Lord’s Day is at hand, the “last days” are inaugurated in which “God declares:… I will pour out my Spirit upon all flesh.” This is the ancient prophecy to which the Apostle Peter refers in the first sermon of the Christian Church which was preached on the first Sunday of Pentecost (Acts 2: 1 7; Joel 2: 28-32). The Divine Liturgy of Pentecost recalls our baptism into Christ with the verse from Galatians again replacing the Thrice-Holy Hymn. Special verses from the psalms also replace the usual antiphonal psalms of the liturgy. The epistle and gospel readings tell of the Spirit’s coming to men. The kontakion sings of the reversal of Babel as God unites the nations into the unity of his Spirit. 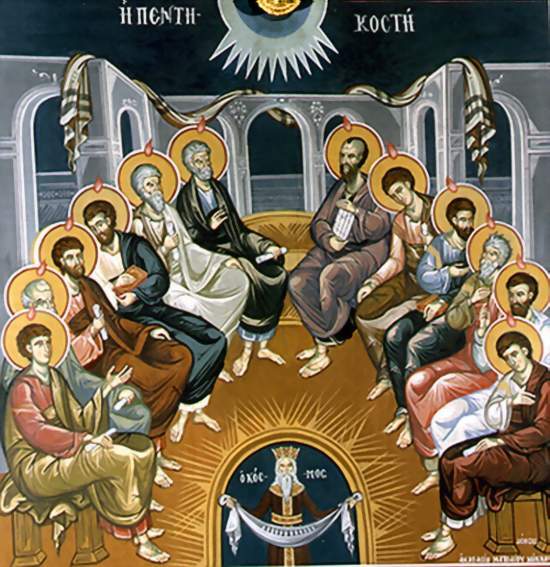 The troparion proclaims the gathering of the whole universe into God’s net through the work of the inspired apostles. The hymns 0 Heavenly King and We have seen the True Light are sung for the first time since Easter, calling the Holy Spirit to “come and abide in us”, and proclaiming that “we have received the heavenly Spirit.” The church building is decorated with flowers and the green leaves of the summer to show that God’s divine Breath comes to renew all creation as the “life-creating Spirit.” In Hebrew the word for Spirit, breath and wind is the same word, ruah. The Great Vespers of Pentecost evening features three long prayers at which the faithful kneel for the first time since Easter. The Monday after Pentecost is the feast of the Holy Spirit in the Orthodox Church, and the Sunday after Pentecost is the feast of All Saints. This is the logical liturgical sequence since the coming of the Holy Spirit is fulfilled in men by their becoming saints, and this is the very purpose of the creation and salvation of the world. “Thus says the Lord: Consecrate yourselves therefore, and be holy, for I your God am holy” (Lev 11:44-45, 1 Pet 1:15-16).